3/18/2007 - Washington-area Hungarians commemorate the 1848 Revolution... Hungarians in the Washington Metropolitan area gathered Sunday, March 18, 2007 at the Wesley Theological Seminary, to commemorate March 15 and the 1848 Hungarian Revolution. The American Hungarian Federation of Metropolitan Washington, D.C., organized the event, and members of the Bathori Jozsef Hungarian Scout Troup of Washington provided a good part of the program. AHF Co-President and Master of Ceremonies, Zoltán Bagdy welcomed the audience and recognized AHF leadership and distinguished guests from the Hungarian Embassy, the William Penn Association and the Hungarian Reformed Federation. The Reverend Dr. Imre Bertalan opened the commemoration with a retrospective look at the 100-year history of the American Hungarian Federation and reviewed the various events and celebrations AHF is planning for the coming year. AHF Vice-President Yvette Görög-Boone, an attorney who received her law degree in Budapest and her Master of Laws degree at Georgetown University Law School, delivered the keynote address calling on the Hungarian community to rekindle the spirit of 1848 and to guard Hungary's place in the community of democratic nations: "Washingtonban es az amerikai fovaros kornyeken elo, dolgozo es tartozkodo magyarok, akik valoszinuleg hozzam hasonloan sokszor elgondolkodtak az amerikai demokracia ervenyesulesen es a szabadsagjogok szeleskoru megvalosulasan es parhuzamba allitottak es allitjak azt a mindenkori aktualis magyarorszagi helyzettel. Bizony hosszu ut all meg elottunk. Bizony sokat kell meg tanulnunk." "Gondolkodjunk tehat el azon itt Magyarorszagtol ugyan tavol, hogy mit teszunk vagy mit tehetunk azert, hogy az 1848-as forradalom szellemehez es hoseihez meltoan Magyarorszag megorizze kulturajat, nyelvenek gazdagsagat, apolja tortenelmet es hagyomanyait, valamint megorizze helyet a demokratikus es szabad allamok soraban az europai nemzetek kozott." 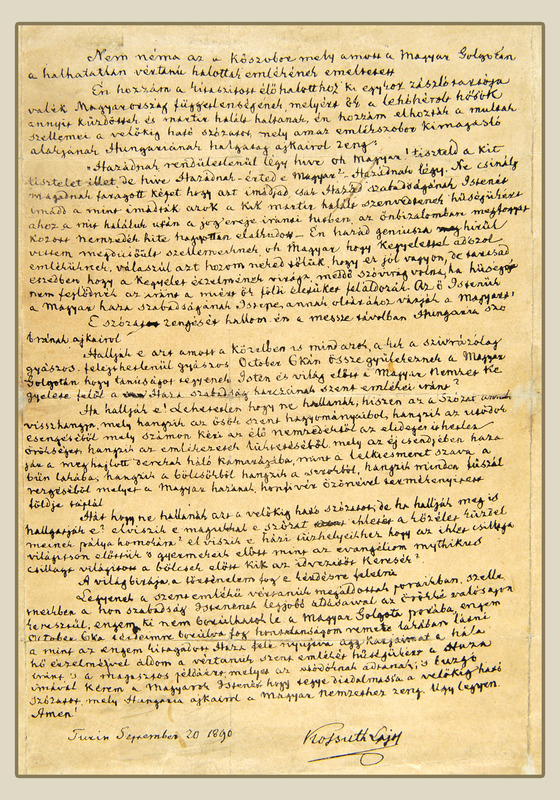 [Click here to download] the text of her address (in Hungarian/Magyarul). "In evaluating countries today, we tend to look at only one aspect of democracy – elections. Remember the purple thumbs in Iraq? Yet, suppose elections are free and fair, but those elected are not committed to the rule of law, to individual and minority rights, to freedom of expression, assembly and religion, or to the right to private property. Aren’t we then left with of the "tyranny of the majority," as Tocqueville warned? Don’t we end up with illiberal democracy instead of with the bundle of rights protected by constitutional liberalism, as Fareed Zakaria pondered in his November, 1997 Foreign Affairs article, “The Rise of Illiberal Democracy”? As we observe Central and Eastern Europe, we see free and fair elections. But is democracy as defined by Kossuth prevailing? Often the answer is “yes,” but are “all the people” considered when, for example, police rules and regulations are ignored, as we witnessed last October in Budapest? Are “all the people” considered when Romania lavishly funds the Orthodox Church that is engaged in a church building spree, but fails to return to the rightful Hungarian owners the more than 2000 religious and communal properties illegally seized from them during the Communist era?" The title of his address was “Kossuth and the Meaning of Democracy.” [Click here] to download the text. The scouts recited poetry of the period and sang Kossuth songs. One of the scouts, Sebestyén Szollos, performed Franz Schubert's Impromptu No.4. Opus.90. Sári Bárczay recited the “Nemzeti Dal.” Viktor Szederkényi represented the Hungarian embassy and spoke about the significance of 1848 for Hungarians in our time. The Reverend Zoltán Kovács, assistant pastor of the Hungarian Reformed Church of Washington closed the commemoration. Click the pictures for larger versions. Kossuth was greeted with wild enthusiasm across the country. He was only the second foreign leader (second to Lafayette) to address a joint session of Congress. Kossuth even spawned a fashion craze (moustache-less beard with TopHat) in the ever trendy US. The American Hungarian Federation dedicated a bust that now sits proudly in the US Capitol - it reads, "Louis Kossuth, Father of Hungarian Democracy"